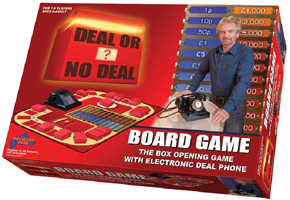 You can now beat the banker in your very own living room with the official deal or no deal board game available to buy online. If you love watching Deal or no Deal on TV then you will love playing the official DOND board game with your family and friends. The board game is just like the TV show and replicates those nail-biting moments when your waiting for that big offer! The very clever board game includes a direct line to the banker with your very own mini telephone, the game gets very real with that telephone rings. Unfortunately you cannot speak to the banker when the phone rings but instead you are shown the bankers offer on a small screen at the front of the telephone. Just like the TV game you can choose to deal or not to deal at each offer. You can also choose to stick or swap your box but only if the banker offers you the choice. The board game is unlike any other as it electronic giving players a much more interactive feeling, as you get rid of the 22 boxes they will vanish from the electronic screen in the middle of the board. This game is great fun for the whole family proves to be an instant classic. We just think it is a shame that a mini replica of Noel is not included. If you want to play DOND online you can read what we think of the very popular online deal or no deal game, enjoy! The deal or no deal board game is available from all leading retailers including online shops such as amazon.co.uk and play.com.